DOZENS of current and former members of Henley Hawks’ women’s squad attended a dinner at Henley Rugby Club to mark the team’s 20th anniversary. The event included a speech by former Hawks player and England women’s rugby captain Tamara Taylor. 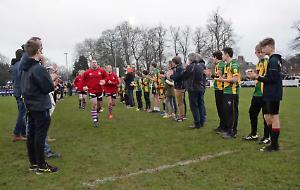 Speeches were also given by ex-Hawks team prop Rochelle “Rocky” Clark MBE, England’s second most-capped ladies’ player of all time, former Hawks and England centre Rachael Burford and former national women’s coach Gary Street.